Within days of the German invasion of Den­mark and Nor­way on April 9, 1940, it became clear that the Nor­we­gian armed forces could not resist the more power­ful Wehr­macht (German armed forces), bris­tling with modern wea­ponry and sup­ported by highly effec­tive air cover. Caught largely by sur­prise, the mili­tary’s ini­tial defense in the south of Nor­way was largely disor­gan­ized and inef­fec­tual, though suffi­cient to allow King Haakon VII and his govern­ment to escape cap­ture. A solu­tion along the lines achieved in Den­mark, which capitu­lated to the Ger­mans on Day 1 of the invasion, would appear to have spared the nation many deaths and much des­truction. Never­the­less, an organ­ized and spirited mili­tary defense and counter­attacks in parts of West­ern and North­ern Nor­way began, aimed at securing stra­te­gic posi­tions along the coast with the help of British, French, and Polish forces. The May 10, 1940, Nazi in­va­sion of France, which managed to corner the broken remains of the French Army and the Bri­tish Expe­di­tion­ary Force in the Dun­kirk poc­ket (May 21 to June 4), knocked that plan into a cocked hat. On this date in 1940 the Nor­we­gian govern­ment held its last meeting on Nor­we­gian soil in Tromsø nearly 200 miles north of the Arctic Circle and far from the nearest Ger­man lines. A few hours later the king, crown prince, mem­bers of the govern­ment, and the diplo­matic corps—a total of 400 pas­sen­gers—boarded the Brit­ish heavy cruiser HMS Devon­shire for exile in Eng­land. All service­able Nor­we­gian naval ves­sels, air­craft with ade­quate range, and merchant ships joined the exodus. Late the next night the order to de­mo­bilize the remaining Nor­we­gian armed forces was issued. The Ger­mans did not inter­fere. The Ger­man and north­ern Nor­we­gian com­mands signed a cease­fire on June 10, 1940. The cease­fire did not pre­vent Nor­way’s legit­i­mate govern­ment—now oper­ating out of Lon­don—from con­tin­uing the struggle as a mem­ber of the Allies against the Ger­man in­va­ders. Most Nor­we­gians remained loyal to their king, and patriots did not hesi­tate to ridi­cule Vid­kun Quis­ling (1887–1945) and his collab­o­ra­tionist govern­ment in Oslo. (The word “Quis­ling” entered the Eng­lish lan­guage as a syno­nym for “traitor.”) The Milorg resis­tance move­ment, which began life as a small sabo­tage unit but ended up as a 40,000‑strong mili­tary force, played a cru­cial role in forcing Ger­man capitu­lation in Nor­way in May 1945 and in stabi­lizing the country during the postwar years. 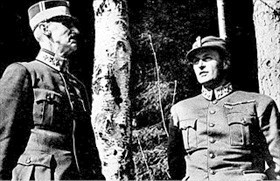 Left: Norwegian King Haakon VII and Crown Prince Olav sought shel­ter in the area of Molde on the coun­try’s west coast during a Ger­man bombing of the town in April 1940. The Luft­waffe endeavored to kill the king, the royal family, and mem­bers of the legiti­mate Nor­we­gian govern­ment after their suc­cess­ful escape from Oslo in the after­math of the Ger­man in­va­sion of Nor­way. The king, his family, and his govern­ment were con­veyed by a Brit­ish cruiser 600 miles north to Tromsø, where they estab­lished a provisional capital on May 1, 1940. Right: Norwegian refugees cross the border into Swe­den. Through­out the war years, a num­ber of Nor­we­gians fled from the reaches of the Quis­ling regime. These included Nor­we­gian Jews, poli­ti­cal activ­ists, and others who had rea­son to fear for their lives. Nor­we­gian border pat­rols were estab­lished to stop these flights across the long bor­der with Swe­den, but locals who knew the woods found ways to bypass them. Left: Although neutral, Sweden surrep­ti­tiously aided the Nor­we­gian resis­tance move­ment with training and equip­ment in a series of camps set up in mid-1943 along the Nor­we­gian border. 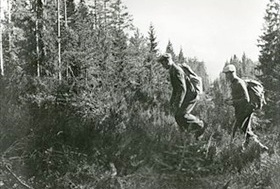 To avoid sus­pi­cion, the Swedes camou­flaged the camps as police training camps. Funding came from the Nor­we­gian exile govern­ment in Lon­don. 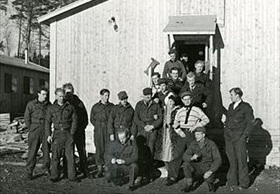 By 1944, some 7,000–8,000 men had been trained in Swe­den. After the Ger­man capit­u­la­tion in Oslo in May 1945, around 13,000 police troops were trans­ferred to Nor­way to help bring security and stability to the new government. 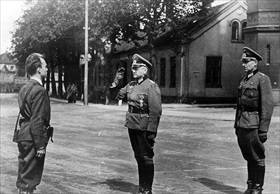 Right: Armed only with a handgun, Col. Terje Rollem, Milorg dis­trict chief for Oslo, assumed com­mand of Akershus For­tress on behalf of the Nor­we­gian Resis­tance, May 11, 1945. The hand­over occurred in front of the Ger­man com­man­dant’s resi­dence. Rollem and the com­man­dant’s adju­tant (right in photo­graph) walked around the castle grounds, sub­sti­tuting Milorg men for Ger­man guards, who were taken to a POW camp. This iconic photo came to be dis­played in homes all across Norway as a symbol of the country’s liberation.